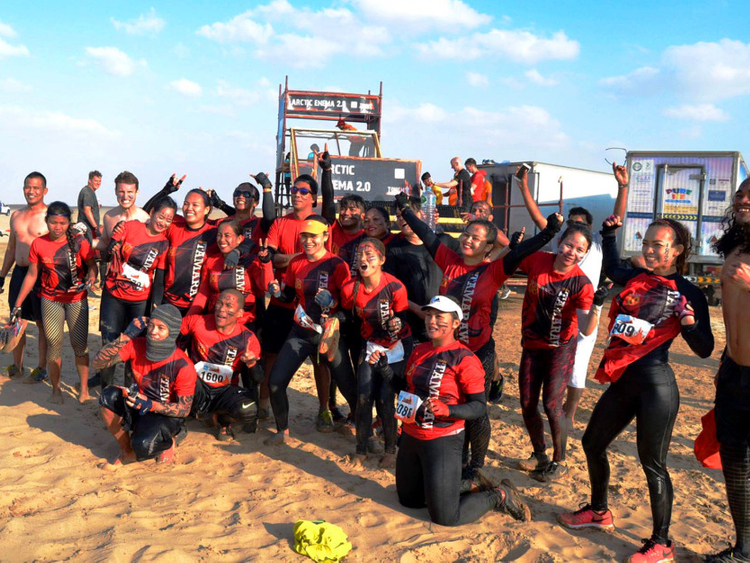 The 16km, 20 obstacle du Tough Mudder event from December 9 to 10 emphasised teamwork and my Team Tamaraw felt right at home. I’ve done many obstacle and adventure races in the past but I’m certain I’ve never enjoyed and had this much fun. Sun, sand, rocks, dirt and mud are a given. It boils down to teamwork and camaraderie which is very evident especially in the later obstacles of Tough Mudder, most notably the Pyramid Scheme, Blockness Monster, and Everest 2.0. Not to diss on the other prominent races as they may appear the same but their dynamics largely differ. “It’s about working together to get over obstacles, and I think that’s the reason that our events become the biggest event worldwide and why it’s the most popular.” says Will Dean, CEO and Co-Founder of Tough Mudder. Tough Mudder first and foremost isn’t actually a race, there is no keeping time. While you can power your way through the grueling obstacles in Spartan and Desert Warrior alone, you can’t go over some in Tough Mudder unless you have helping hands... and feet... and shoulders... practically your entire body needs to support the teammate next to you. And there lies the beauty of the event. From what I saw, ours must have been the biggest contingent. We are 26 strong in Team Tamaraw and each one played key roles in pushing and pulling everyone to conquer all 20 obstacles. The aforementioned Pyramid Scheme and Everest 2.0 didn’t just require teamwork, it demanded that you trust your teammate with your life. Our team, having previously trained and bonded over several races together, did that with flying colours. An event marshall who followed us said we were an example of ‘perfect teamwork’. Those words are exactly what Tough Mudder delivers and brings out in you. And if you don’t want to stick around for so long and swap faces with people in your group, there are extreme challenges as well to test you individually. Riiiiggght... let’s talk about those two, shall we? Arctic Enema 2.0 for those who can’t be bothered to Google search is a slide down the frozen path, an icy plunge. But there’s more! You have to hold your breath and fully submerge yourself under a thick layer of ice to crawl through a small opening to get to the other side! And if that doesn’t shock your system, Electroshock Therapy will! As the name suggests, dozens of live wires hanging from above randomly deliver 10,000 volts to unsuspecting ‘mudders’ on their way to the finish. As the last obstacle of the event, this is Tough Mudder’s version of the Russian roulette. You run through it and hope for the best that the wires don’t zap you. Unfortunately for me and many of my Team Tamaraw mates, we felt a few jolts. The split-second shock was enough to momentarily immobilise our bodies sending us crashing down face first into the mud. You would think these types of challenges would deter people, but ever since its inception in 2010, many have done it and many will still do it. “This year, over a half a million people worldwide will do the event in ten different countries in four different continents, it’s a global phenomenon. Over 10,000 people are part of the Mudder Legion who’ve done over 10 events worldwide... you need to be in shape but you don’t need to be an elite athlete,” says Dean. “You see people in the course who are in their 40s, their 50s, into their 60s, and it’s 50/50 male and female. It isn’t a matter of needing to be an elite athlete in your 20s to do it. When you finish you feel great about yourself. You’ve done something you can be proud of, and you can take that into your life. One of the things we always see what people do in the event is they thought they’d come and do it once but then they get hooked on this way of life. And we’ve changed people’s lives, we’ve made so many people healthier, happier, we’ve got them to do things that challenge themselves and I’m very proud of it. But the most important thing I’d tell people is it’s fun, it’s social, and as long as you put your mind to it you can get around the course. Fun it was! We all loved it. Through 20 obstacles across 16km, all the pain and suffering along the way, completing the course with friends (who I consider family) was an extremely rewarding experience. We pushed our limits and tapped into our potentials. We ended up knowing ourselves better, and caring and respecting one another even more. My Team Tamaraw will remember December 9, the day we took on Tough Mudder and take what transpired in it with us for life. On a side note, I never thought in all my years, I’d work this hard to earn THAT orange headband.